Download any of these free resources. What Does it Take To Become Successful In Today’s Digital World? Download the abstract for my 2018 conference talk. You can start this at any time to get your life back under control. 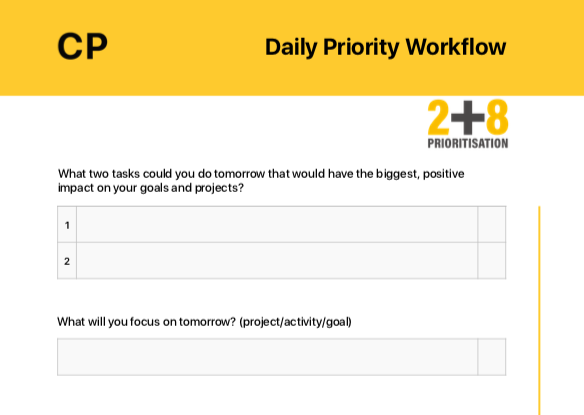 Use this workflow as part of your Golden Ten to really focus in on what is important to you. Use this guide as a way to focus you in on what is important to you each week. A Great way to keep you on track to achieving your goals. Download my Golden Ten checklist. A checklist to use to close out your day and prepare for an amazingly productive day ahead. Find out everything you need to know about building your own business and success with this free downloadable guide. You can download a copy of my weekly review checklist here. Here's a copy of my daily mini-review checklist. Hopefully this will inspire you to create your own. For your mobile phone and computers. Get you own free copy of the InboxZero 2.0 workflow here.